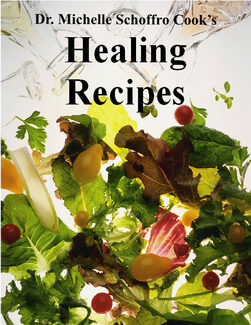 Dr. Michelle Schoffro Cook's Healing Recipes is packed with over 150 delicious AND nutritious recipes. From power-packed smoothies to internationally-inspired main dishes, you'll find so many choices for every palate. And, who told you that desserts couldn't be part of a healthy lifestyle? Your sweet tooth and the rest of your body will love you when you sample from 23 easy-to-make delectable desserts. All of the recipes are dairy-free, low-sugar, no artificial sweeteners or anything artificial. Most are gluten-free, vegan, and alkalizing. You'll find Healing Recipes for every kind of diet. This e-book is available as a pdf file which you can download after purchasing the e-book. Pdf files work on most computers. You will be sent a link to this e-book which you click to download. This link is available for 72 hours after purchase so be sure to download your e-book as soon as possible.